It's six months today since the Olympic Opening Ceremony, the moment when the nation decided maybe it was going to enjoy the summer after all. It seems so long ago now, doesn't it? So six months on I thought I'd go back to three locations that sparkled temporarily during the Games, to see whether all trace has yet been swept away. One north of the river, two south. The Olympic Park: You'll not be getting inside the Olympic Park for a while yet. Six months today, to be precise, when the northern half reopens for the public to shufti around. In the meantime the deconstruction continues, and the place has a desolate empty air. The Aquatic Centre looks forlorn with the sides of its wings removed, with the wind free to whip across the grandstands once covered with seating [photo]. Scaffolding is going up inside, where the final outer walls will be, enclosing a much smaller, more sustainable inner space. The stadium lies empty and unaltered, while the relevant authorities continue to fail to decide who should own it. There are plans for a music festival or two to move in during the summer, although it's hard to imagine the area as an entertainment focus during the chilly days of winter. 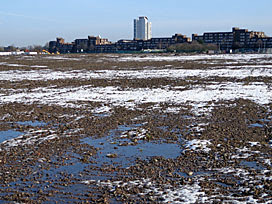 Festivalgoers will also use the site of the Riverbank Arena, where the hockey was held, which has long been removed and levelled. This is part of the Legacy Development Corporation's strategy of finding creative uses for patches alongside the park ultimately designated for housing. As for the Basketball Arena, the knobbly cuboid that looked like it was made from icing, that faces a less happy future. It was built in the hope of transferring the entire building to Rio, but Rio doesn't want it, so it'll probably end up scrapped and recycled. » An Ordnance Survey map of the Olympic Park 2030 can be viewed here. Free copies available at the View Tube. I walked along the Greenway yesterday morning, and peered down over all the nothing much that's currently happening. Large expanses of tarmac lie waiting for whatever's going in next, while the river Lea winds through between leafless saplings [photo]. The stadium's not the draw it was, so the cafe at the View Tube rarely has queues and the viewing platform up top is barely used. There's a rather nice exhibition called Dispersal in the sheds out front. Photographers Debra and Marion visited dozens of businesses that used to occupy the Olympic Park before they were wiped away, and interviewed staff and took pictures. The resulting posters made compelling reading, not always with a happy ending, but unfortunately the content doesn't appear to be available anywhere online. 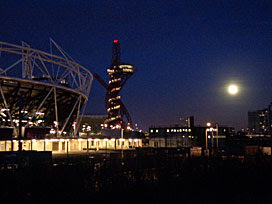 I walked along the Greenway again after sunset yesterday evening as the full moon shone brightly over the floodlights. The Stadium was otherwise in darkness, although the stairs were lit, and the service level below was fully illuminated. Along the Olympic Park's pedestrian spine the solar-powered lighting towers glowed red, then blue, changing colour just as they did six months ago. But that was nothing compared to the Orbit, which was blazing light from top to bottom, around the observation deck and round the spiral stairs [photo]. This illumination seems a colossal waste of money given that the Orbit's not due to reopen to the public until next year. And yet somebody's inside enjoying the facilities, because twice I watched the lift descending from the upper floor. It could just be the caretaker, obviously, but it's galling to see so large a sculpture wasting away after a mere four weeks of use. Update: Park in Progress tours begin at Easter 2013. The bus ride and a trip up the Orbit will cost you £15. 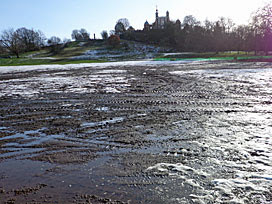 Greenwich Park: There was a huge fuss before the Olympics about the damage the equestrian events might do to the Royal Park. Don't you dare take our park, cried NOGOE, because you'll never be able to restore it properly. Six months on, the evidence isn't good. Large parts of the lower park are screened off behind plastic barriers, broken only by criss-crossing footpaths. Across the main lawns, between the Queen's House and the Observatory, what used to be lawn is reduced to a series of segregated triangles. Lower down they're green, although still very obviously rolls of turf that haven't bedded in. Gaps exist between the stripes where the grass hasn't knitted together, and it'll be some time before this looks anything other than artificial [photo]. But that's hugely better than the mess further up the slope, where a large brown muddy swathe is reminiscent of the muck at Woolwich. This is where the horses trotted last summer, and where we sat, but remains a no-go-area today. Tourists walking from the town centre up to the Observatory follow paths through this zone of mud, which also forms a significant part of the view once they reach the top [photo]. Rest assured that repairs are underway across most of the lower park, not just in the space where the equestrian venue was plonked. Roads and paths left in a poor condition after the Games are still being restored by The Royal Parks, who are also performing routine work like you might expect in the winter months. Laminated notices announce that all should be complete by 28th March, just in time for Easter, although it's hard to imagine anyone settling down on the lawns for a bank holiday picnic. I'm sure the end results will eventually be acceptable - the park's custodians and users won't settle for anything less. But I was expecting better by now, and I fear 'good enough' may still be several months away.